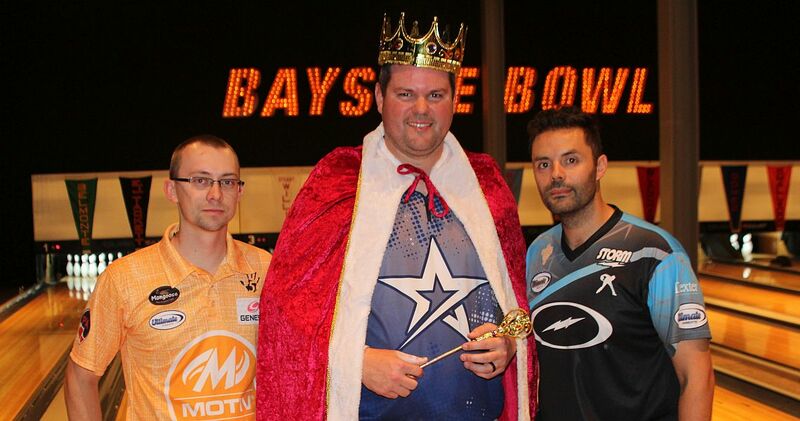 Home » Navigation » PBA » Spare Shots » Will Jones remove Malott’s crown in King of Bowling duel? 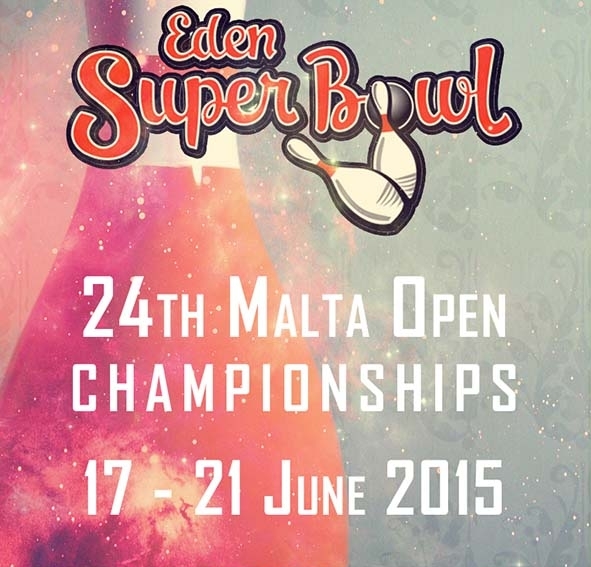 Will Jones remove Malott’s crown in King of Bowling duel? 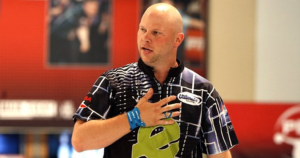 The question of the week is, can Wes Malott retain his “King of Bowling” crown one more time against a sure-fire future PBA Hall of Famer, South Carolina’s Tommy Jones? In an online vote, PBA fans selected Jones (pictured left) – an 18-time PBA Tour titlist, former Rookie and Player of the Year – as Malott’s opponent for the next chapter of PBA’s King of Bowling challenge series. 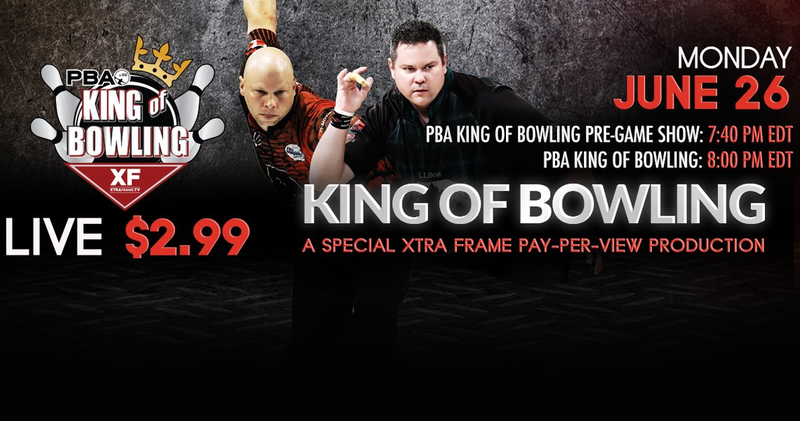 The exclusive best-of-three-game Xtra Frame pay-per-view match will take place Monday at FireLake Bowling Center in Shawnee, Okla., prior to the start of PBA’s Grand Casino Hotel & Resort Oklahoma Open. The pay-per-view match will begin with a pre-game show at 7:40 p.m. EDT on Monday with the match starting at 8 p.m. For subscription and schedule information click here. Malott, nicknamed “Big Nasty” and “Sir Strikes-a-Lot,” has successfully defended his King of Bowling crown six consecutive times, dating back to the original series held at Kegel Training Center in Lake Wales, Fla., in 2009. Most recently he won the revival of the competition in April in Portland, Maine, where he rolled a 721 series to defeat reigning PBA Player of the Year EJ Tackett (left; 664) and Australia’s Jason Belmonte (right), PBA Player of the Year the three previous years (640). Malott’s victims in Lake Wales included, in order: Chris Barnes, 268-214; Patrick Allen, 258-234; Walter Ray Williams Jr., 300-238; Rhino Page, 257-233, and Parker Bohn III, 300-223. PBA Hall of Famer Randy Pedersen will man the Xtra Frame announce booth and Chris Barnes, the first player Malott dispatched to start his winning streak, will work the event as Xtra Frame’s “sideline reporter.” Barnes will be in the settee with the players asking them questions before, during and after the match. Headlining Xtra Frame’s upcoming live streaming schedule will be the “throwback” PBA Xtra Frame Billy Hardwick Memorial Open presented by his son, Chris Hardwick, from Billy Hardwick’s All Star Lanes in Memphis, Tenn., June 24-25, followed by qualifying round coverage of the PBA Grand Casino Hotel & Resort Oklahoma Open from FireLake Bowling Center in Shawnee, Okla., June 27-30. Two days of live ESPN coverage of the Oklahoma Open’s nine-player stepladder finals is set for Saturday and Sunday, July 1-2, at 1 p.m. EDT both days. Live ESPN coverage also will be available on ESPN and the WatchESPN app. The Hardwick Memorial Open, which will limit all players to using two low-tech polyester plastic bowling balls for the duration of the tournament, is the sixth PBA Xtra Frame Tour event of the season, offering a $10,000 first prize and a PBA Tour title if the winner is a PBA member. This week’s PWBA Tour coverage focuses on the qualifying and match play rounds of the Go Bowling PWBA Players Championship from The Ashwaubenon Bowling Alley in Green Bay, Wis. Friday and Saturday, leading to the live CBS Sports Network stepladder finals Sunday at 10 a.m. CDT. 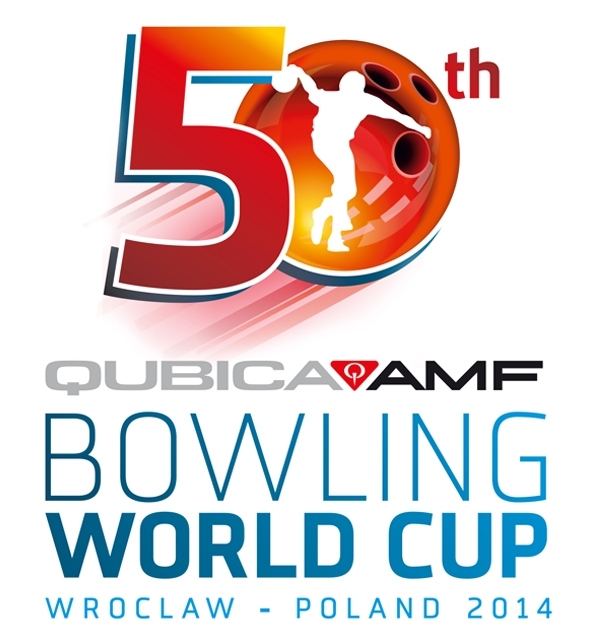 Coverage of PWBA’s Orlando Open will follow June 30-July 1. 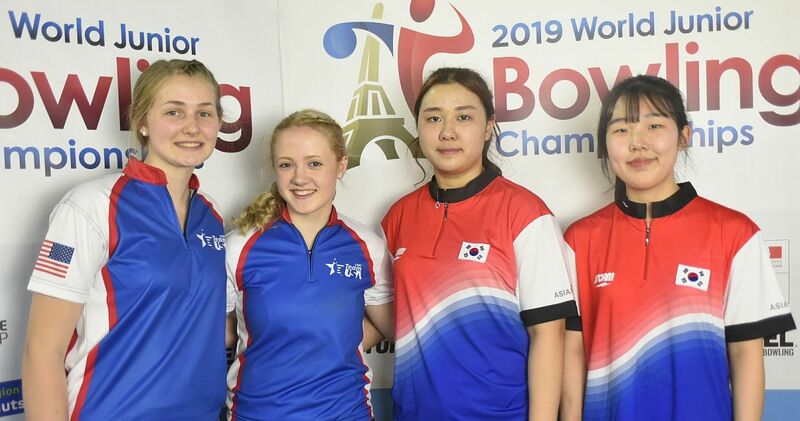 Xtra Frame’s July schedule includes the Teen Masters from Richmond, Va., July 5-7; the PWBA St. Petersburg-Clearwater Open from Seminole, Fla., July 7-8; the Proprietors Cup from Beavercreek, Ohio, July 8-9; the Nationwide PWBA Rochester (N.Y.) Open, July 14-15; the PBA50 South Shore Open from Hammond, Ind., July 25-27; the XF Striking Against Breast Cancer Mixed Doubles from Copperfield Bowl in Houston, Texas, July 28-30, which will award PBA and PWBA Tour titles; and the PBA50 Dave Small’s Championship Lanes Classic from Anderson, Ind., July 30-Aug. 1. For broadcast time and other details, check under the “schedules” tab on pba.com. For subscription and schedule information click here. PBA fans also can follow real-time results for PBA50, PBA Xtra Frame Tour and all PBA Regional events by visiting the “live scoring” feature on pba.com. PWBA live scoring is available on pwba.com. 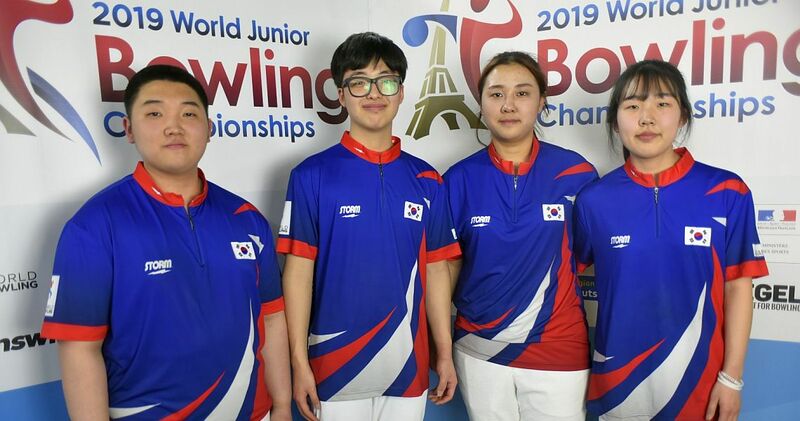 Due to the re-scheduling of World Bowling Men’s World Championships and end-of-year World Bowling Tour events in the Middle East, the World Bowling Tour Men’s and Women’s Finals presented by the PBA have been added to the GEICO PBA World Series of Bowling IX ESPN television schedule. 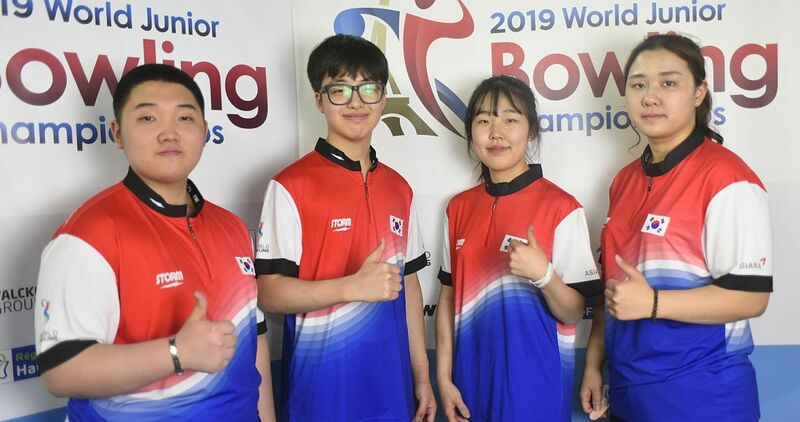 WBT points events yet to be contested include next week’s PBA Oklahoma Open, the Sweden WBT in Malmo, Sweden, Aug. 14-28, and the Thailand WBT in Bangkok, Sept.30-Oct.
Construction of a new Kuwait Bowling Center in Kuwait City has been delayed, forcing World Bowling to move its Men’s World Championship to the South Point Bowling Plaza in Las Vegas, Nov. 24-Dec. 4, following PBA’s WSOB IX in Reno. The Kuwait construction issue also led to the cancellation of planned WBT events in Bahrain and Saudi Arabia. 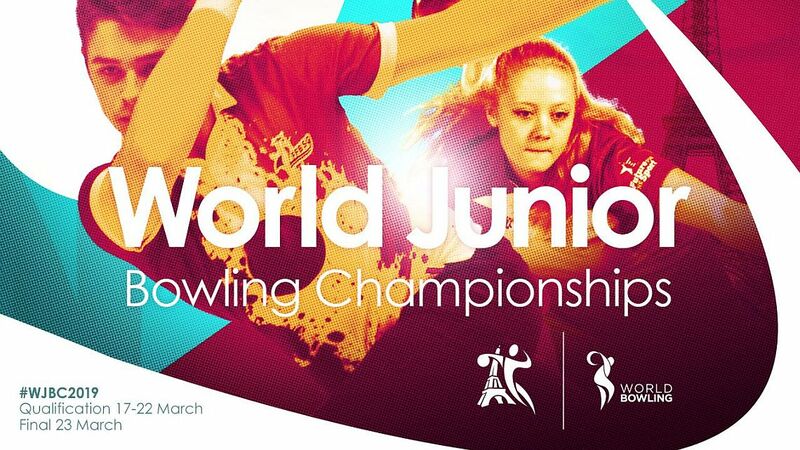 World Bowling has awarded the 2021 World Championships to Kuwait. 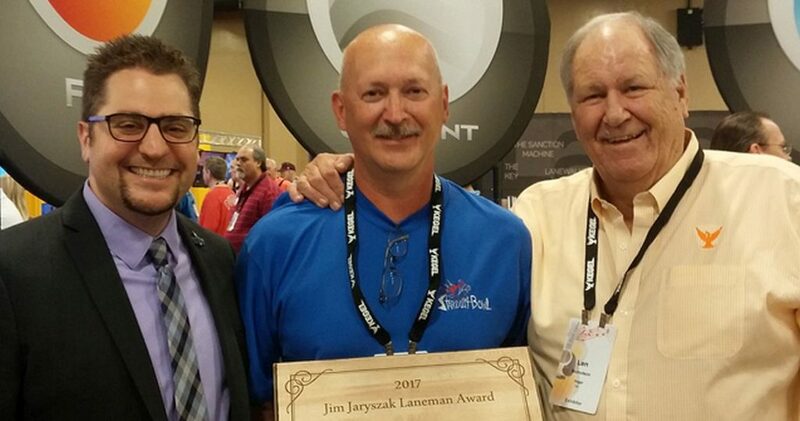 Bob Hileman of Portage, Ind., a three-time PBA Midwest Region Pat Patterson Award winner, has been named recipient of the 2017 Jim Jaryszak Laneman Award by the United States Bowling Congress Equipment Specifications and Certifications team in recognition of his behind-the-scenes work as a laneman. Pictured above: Bob Hileman, center, is presented the 2017 Jim Jaryszak Laneman Award by USBC President Frank Wilkinson, left, and Len Nicholson, the first recipient of the award. “It was a total surprise,” said Hileman, who competed in 205 PBA Regional events, winning his only title in Raytown, Mo., in 2002. Hileman has been the laneman at Stardust Bowl II in Merrillville, Ind., for more than 35 years. He was instrumental in running PBA national and regional events held at Stardust Bowl, including the PBA Tour Trials. He earned his Pat Patterson Awards for individual contributions toward the PBA Midwest Region program. Past recipients include Sam Baca, the PBA’s first Director of Lane Maintenance; Kegel founder John Davis, and PBA Tour titlist John Forst, who died hours after receiving his award in 2016 of circumstances related to terminal brain cancer. Len Nicholson, also a former PBA director of lane maintenance and a member of the PBA Hall of Fame, was the first recipient of the award. 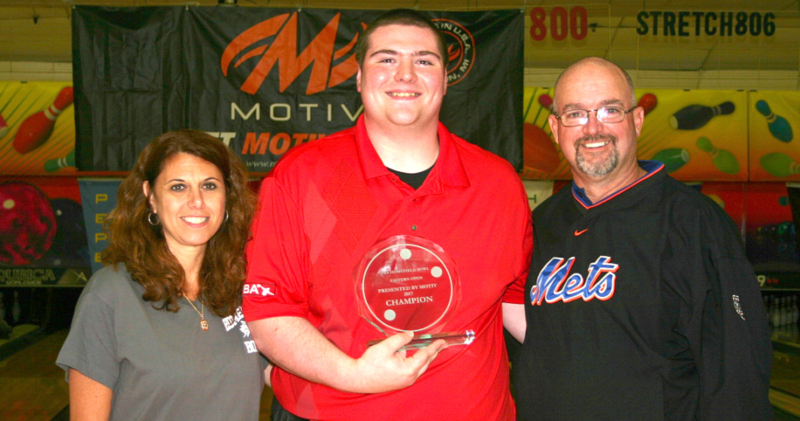 Darren Andretta (above center with proprietors Joette and Mike Healy) of New Hyde Park, N.Y., defeated Matt O’Grady of Rahway, N.J., 258-230, to win the PBA Homefield Bowl Open presented by MOTIV at Homefield Bowl in Yonkers, N.Y., Sunday. The win, his first in seven years of membership, proved a perfect Father’s Day gift to his father Bob. His father, also a PBA member, arrived during the match play finals along with the rest of the Andretta family. Andretta, who earned $3,000, compiled a 10-2 match play record to qualify second. He defeated Jon Van Hees of Charlestown, R.I., 257-209, in the semifinal match to advance to the championship game. Van Hees eliminated defending champion Billy Asbury of Odenton, Md., 224-205, in the preliminary match. 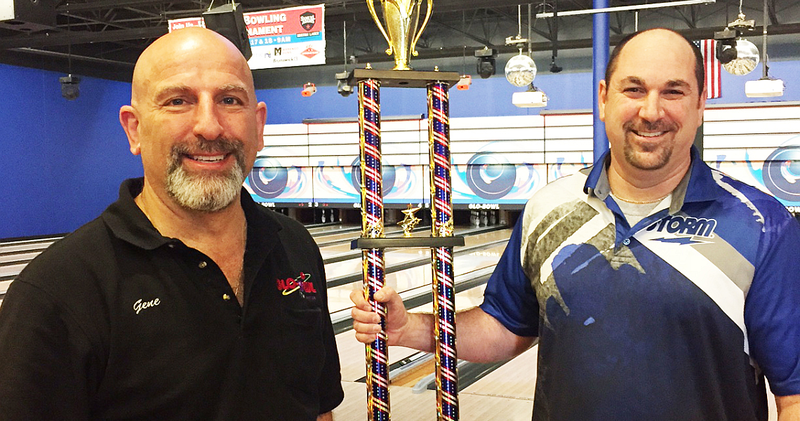 Brian Menini (pictured with host Gene Lindow) from Brookfield, Mo., thwarted David Beres’ bid for his eighth PBA Regional title, 258-172, and won the second annual Glo Bowl Midwest Open, presented by Samuel Adams and Global 900, in Marengo, Ill. The match turned in Menini’s favor when he converted the 3-4-6-7 split in the sixth frame. Beres was unable to string strikes and when he left a 7 pin in the ninth frame, Menini doubled in the 10th to claim his second PBA Regional title and the $2,300 winner’s check. Menini, who finished qualifying in eighth place, defeated top qualifier AJ Johnson of Oswego, Ill., 3-1, in the best-of-five-game Round of 8 and earned his way to the championship match by defeating Nathan Michalowski of Brookfield, Wis., 2-0, in the best-of-three semifinal round. Beres advanced by defeating Christopher Hill of Franklin, Wis., 3-1, in the Round of 8 and defending champion Tom Hess of Urbandale, Iowa, 2-0, in the semifinal round. Greg Young of Viera, Fla., rallied to defeat Orlando’s Shawn Naumann, 195-247, 258-236, 234-177, in a best-of-three-game championship match between amateur players to win the PBA Timmy See Memorial South Open presented by MOTIV at Nassau Bowling Lanes in Yulee, Fla., Sunday. 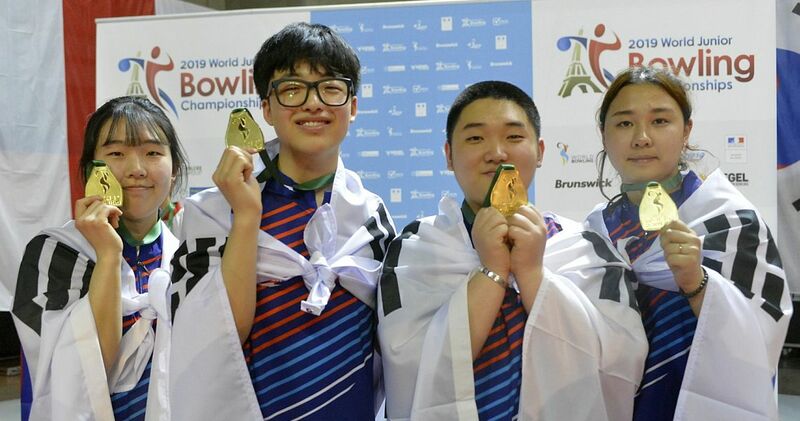 Young, a former three-time Junior Team USA member, earned $2,500 for the win but he doesn’t get credit for a PBA title because he’s a non-member. In the semifinal round, Young defeated Brandon Curtis of Manson, N.C., 2-1, while Naumann also rallied from a 1-0 deficit to defeat Jeff Evans of Supply, N.C., 2-1, in the semifinal round. 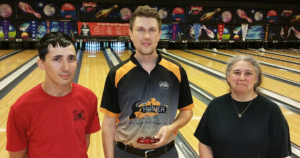 Craig Nidiffer (center, with hosts Brandon and Lisa Keirns) of Trenton, Mich., defeated Matt Sanders of Evansville, Ind., 279-268, to win the PBA Greater Marion Central Open presented by MOTIV at BlueFusion Fun Center in Marion, Ohio, Sunday. Nidiffer claimed his fourth career PBA region title along with the $2,500 first prize. Sanders defeated Kyle Cook of Centerville, Ohio, 289-247, to advance to the championship match. In the first stepladder match, Cook downed J.R. Raymond of Clinton Twp., Mich., 235-216. A busy schedule of PBA Regional events is on tap for the June 23-24 weekend, including the Pro Bowl West Central/Midwest Challenge presented by Roto Grip in Fort Wayne, Ind. ; the PBA50 Ultimate Inserts Midwest Open presented by Hammer at Lakeside Lanes in Davis, Ill., and the PBA/PBA50 Sands Regency Doubles presented by MOTIV at High Sierra Lanes in Reno, Nev. The June PBA Regional calendar closes and July begins with the Grand Casino Hotel & Resort Southwest Doubles at FireLake Bowling Center in Shawnee, Okla., on June 30, preceding the Grand Casino Hotel & Resort PBA Oklahoma Open. 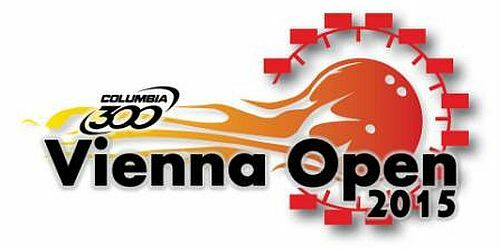 Also scheduled for the June 30-July 2 weekend is the PBA and PBA50 Vanessa Brown Homes West Opens, both presented by Columbia 300 at Yosemite Lanes, in Modesto, Calif.
For complete PBA For complete PBA Regional schedules, rules and entry information, click here to find the event(s) in your area.